Jeroen Janssens's webcast on Data Science at the Command Line proved to be a mix between a good proof that the Unix command-line is not dead for Data Science and a more that two hours hands-on marathon. What made this webcast even more unique was the hands-on element (that more speakers could take example form). Jeroen built the Data Science at the Command Line website almost like a cheat-sheet of his book, but also leveraging his Data Science Toolkit project. Following the clear instructions, the reader or audience member can either spin up a local virtual machine using Vagrant and VirtualBox or an AWS instance to follow along with all the necessary command-line tools already available, without having to go through the involved installation process of each. So if you're wandering if the book with the same title, Data Science at the Command Line, is the book for you, you can get an answer in exchange for 2h of your time. I'm by far not a Unix CLI guru, but I was impressed with how fast and how much you can get done just by leveraging the Unix file system and a good toolbox of command-line utilities. The intro was a beautifully orchestrated parade of Unix command line, that I believe can whet any Data Scientist's appetite. From using asciinema to record and share your terminal sessions to using Rio to load CSV as input into R as a data.frame and generate PNGs with ggplot2, the toolbox proved to be very diverse: some stock, some custom built, but all available in the open domain. our good old friend curl was mentioned again, as expected. 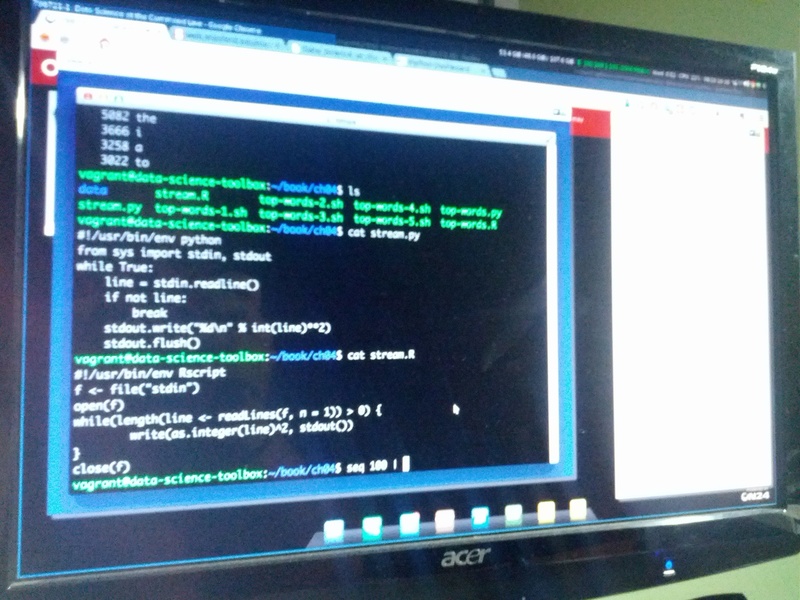 Fantastic presentation and further proof the Unix command-line is not dead for data science. 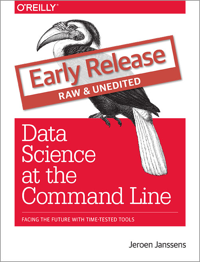 When it comes to the Data Science at the Command Line book, Jeroen did a great job whetting this novice Data Scientist's appetite with the webcast. I'm currently making progress on Python for Data Analysis, but once done, Data Science at the Command Line will be next. And after that? Most likely Thinking with Data, which Jeroen described as a good complement to his book.